The original kitchen was poorly laid out by a serial home-flipper whose “lipstick-on-the-pig” approach wreaked havoc on the kitchen’s function and aesthetic. 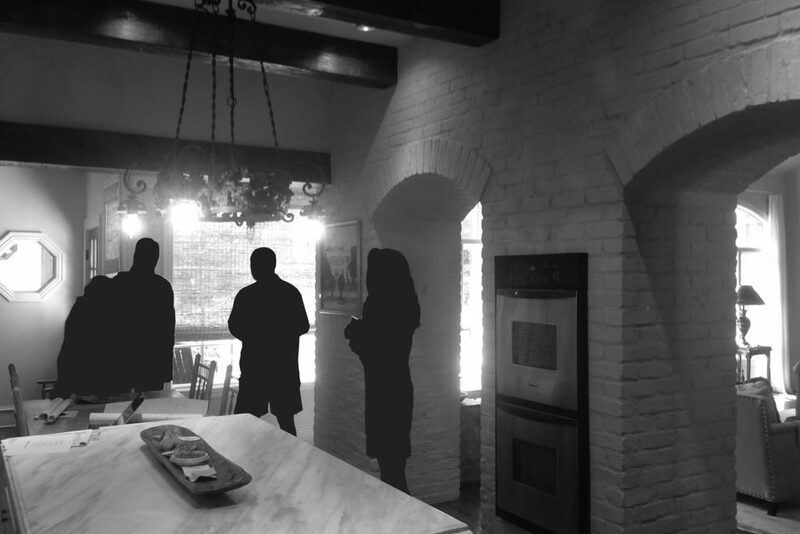 Massive brick archways between the kitchen and the living space hindered the connection to the overall space leaving little room for walkways or storage. Befuddled as to how to improve the space while staying within the footprint, the homeowners’ requests were to have a contiguous kitchen and casual dining space, and to replace the apartment size oven and separate cook top with a 48″ professional gas range. One hurdle in designing the kitchen was trying to make the space functional without moving outside the original kitchen parameters or moving any plumbing. Once the client understood that the placement and thickness of the arches were hindering good and functional design she agreed to take them out. When the arches were deconstructed our team was able to reorient the original island to create better traffic flow and more space for seated diners. We also removed the corner pantry and installed a custom cabinet with rollout drawers, which allows the client to easily view and access all pantry contents without wasting valuable floor space. It also conveniently houses the microwave. Our Design+Build Team identified structural challenges that would need to be overcome once the three large brick archways were removed. By utilizing custom steel brackets and a series of large intersecting structural beams we were able to transfer all roof point loads to the perimeter walls. 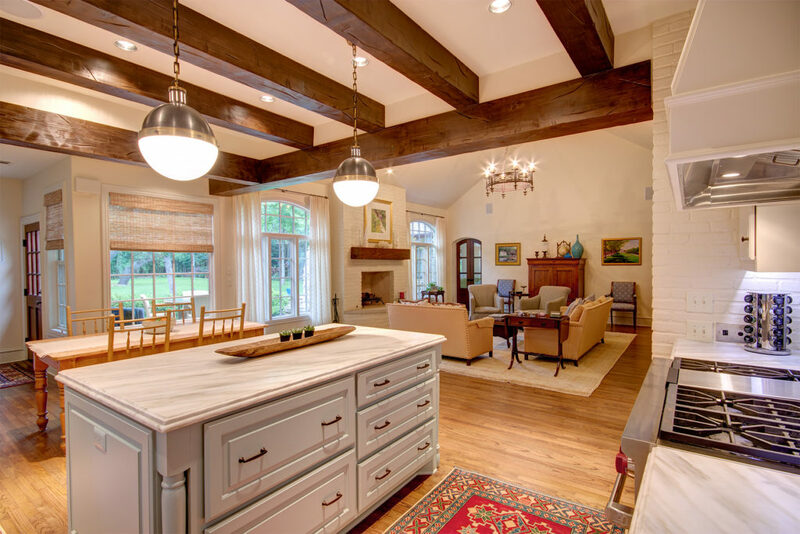 The placement of decorative beams masks the location of the structural elements providing a seamless ceiling transition that is visually appealing. 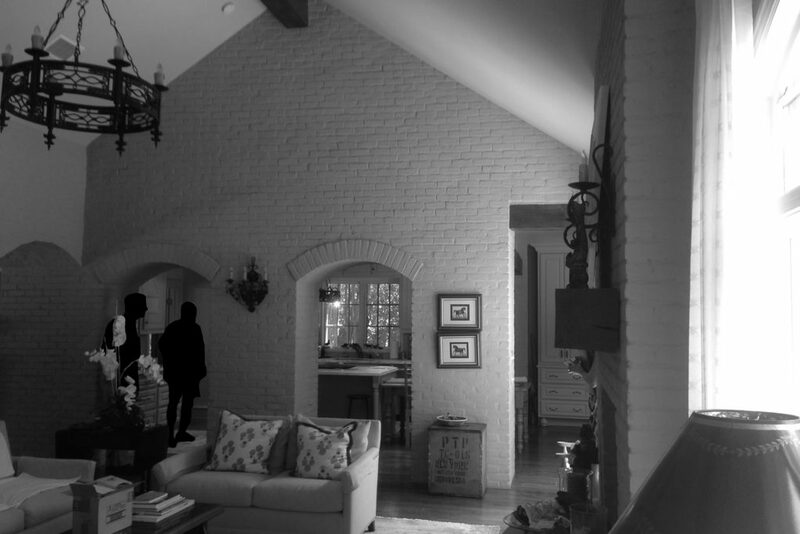 In the original plan, a meager 24″ single oven was placed within one of the arch walls and the cooktop was placed in an odd juxtaposition directly against an adjacent wall. 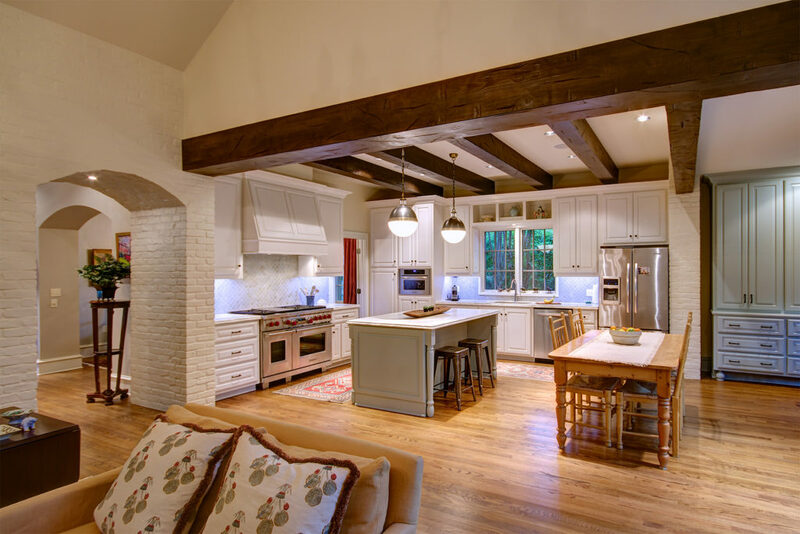 By removing the brick arches and pilaster, and reducing the thickness of the wall we were able to install a new 48″ pro gas range and center it on the wall elevation in order to gain desperately needed storage and counter space. Now, centered in the elevation for a more balanced aesthetic, is a new decorative hood fitted with a functional, appropriately sized blower unit. In order to create a seamless look we custom matched every detail, from the cabinet door and crown moulding profiles to the marble top’s laminated edge. Our crew took painstaking time in finding an exact match to the homeowners existing 2 cm honed marble. We also took great care in reusing as many of the products and materials as possible. For example, since a new sink was requested by the homeowner, we carefully re-fabricated the existing piece marble to reuse on the range wall. The existing hardwood floors were skillfully patched by feathering in new planks and were refinished for a flawless match. A new coat of paint on the perimeter cabinets brightened the space and the island and hutch received a classy shade of French blue to create a subtle contrast with the milky white cabinets and coordinate with the gray-blue hue of the Alhambra shaped tile backsplash. New island pendants from Visual Comfort are the perfect jewelry to complete the new design.